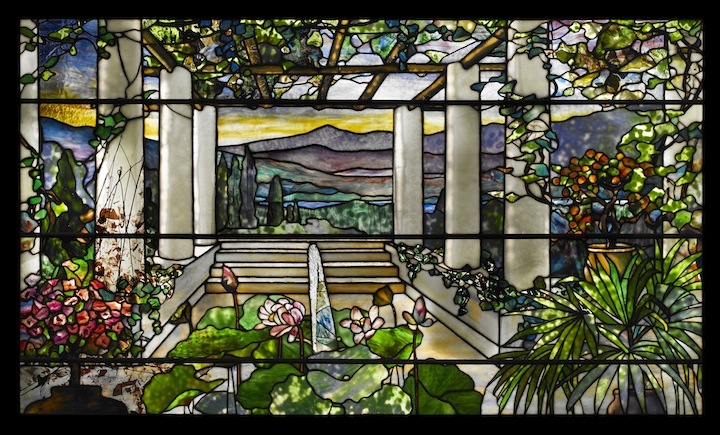 Tiffany Studios, “Garden landscape window,” 1900-10. Photo: John Faier, © The Richard H. Driehaus Museum. Held aloft from the surprisingly quiet corner of Erie and Wabash, David Hanks sat upon the third-floor divan, enveloped in the Gilded Age accouterments of the Driehaus Museum. Legs crossed at the knee and prim navy suit immaculate, Hanks ruminated briefly upon the works of Louis Comfort Tiffany, which sat before us, soft bound and glossy, on the table and also all around us in the period furnishings and windowpanes saturating every room in the house museum by virtue of the Tiffany exhibition he had curated. A woman swaddled in an audio tour drifted aimlessly around us, in quiet consideration of the works, personifying what Hanks was thinking about, if extrapolated to a larger scale: How many Chicagoans must have passed by Tiffany pieces before, in silent, somewhat hurried appreciation, like this woman, albeit sans the benefit of exposition? 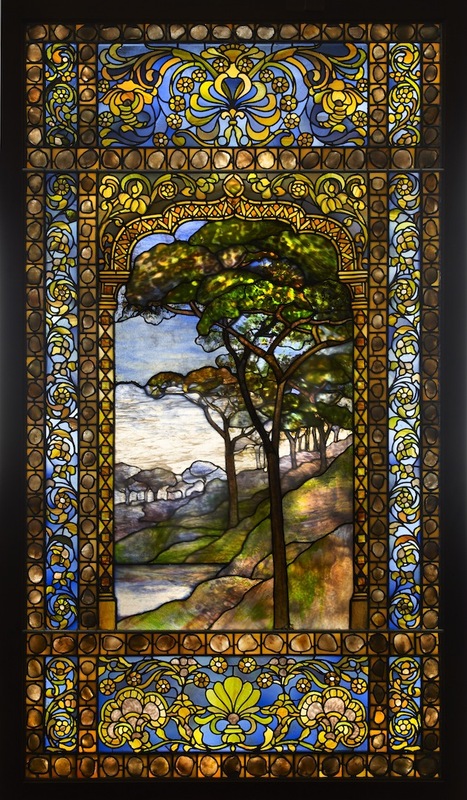 Tiffany Studios, “Landscape window,” 1893-1920. Photo: John Faier, © The Richard H. Driehaus Museum. While his ecclesiastical conscriptions—the most famous of which, according to Hanks, probably being Second Presbyterian Church, which boasts nine Tiffany windows—would remain ubiquitous, beautifully bathing sanctuaries in prismatic dappled light, particularly on the South Side, following a spectacular exhibition at the World’s Fair, which centered around a chapel and altar bedecked in Byzantine-influenced mosaics above which loomed a cruciform chandelier, Tiffany’s reluctant investment in the White City showing reaped dividends as his firm was awarded numerous high profile commissions. “His first commission was at the Art Institute of Chicago for the Henry Field Memorial Gallery,” Hanks said. The designed gallery, which housed Field’s assortment of nineteenth-century French paintings, was dismantled in the 1930s. “It had a stained glass ceiling, sky light, and a mosaic floor,” Hanks said. “Quite a luxuriously decorated room.” Another notable Tiffany contribution, the stained glass dome of Fullerton Hall, remains at the Art Institute intact. The Columbian chapel’s focus on glass mosaics, while a perfect analogue of Tiffany’s adroit understanding of pulchritude and profit—aside from their beauty, the easy-to-clean mosaics were perfectly suited to a city whose trains rattled about in the air—also led to two seminal contributions to Chicago’s urban décor: the “Death of Marquette” mosaic at the Marquette Building, and the tessellated interior of Shepley, Rutan and Coolidge’s Chicago Public Library at Washington Street and Michigan Avenue. The Beaux-Arts building now serves as the Chicago Cultural Center. Tiffany Glass and Decorating Company, Vase, ca. 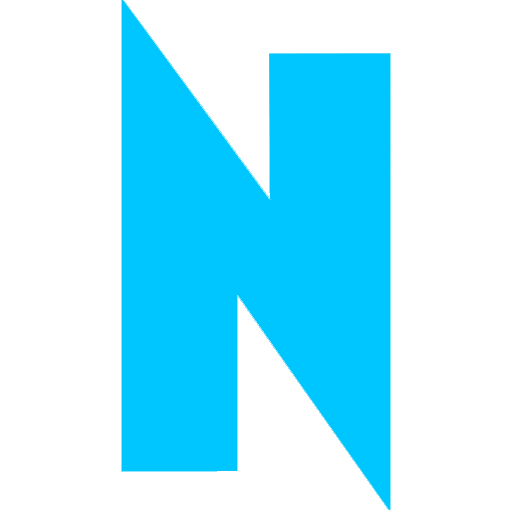 1897-98. Édouard Colonna (German, 1862–1948), Vase mounts, c. 1898. Photo: John Faier, © The Richard H. Driehaus Museum. Tiffany’s aesthetic, which aligned appreciation for nature in all of its colors, shapes, flows and forms, went out of style from the 1930s to the 1950s, a relegation hastened in part, Hanks believes, by the anti-classicism of the Prairie School and the founding of the modernist New Bauhaus in 1937. The long, flat, horizontal bands of Prairie and the form-follows-function, un-ornamented Bauhaus style stand in stark juxtaposition to Tiffany’s florid, often quite literally flowery furnishings, which actively strove to be objets d’art; an inkwell box of painted bronze, lustrous Favrile glass—among the numerous pioneering glass techniques Tiffany developed—on its lid and flanks, with nacreous Favrile wells inset like pearls, for example, is indicative of how Tiffany transformed everyday objects into pretty marriages of design and art. Whipsawed by the exsanguination of both his popularity and the South Side’s economy, sweeping swaths of Tiffany’s Chicago works have been lost, particularly the church windows that were the company’s mainstay; Hanks estimated the number to be as high as nearly half. “Most of the windows were on the South Side, and a lot of those churches have been demolished,” Hanks said. Those that avoided razing had their windows plucked from them, by means both legal and non, then sold, sometimes without documentation, further roiling a definitive picture of Tiffany’s influence on the city’s face. What remains, however, at Marquette and Fullerton Hall and the Chicago Cultural Center, serve as ornate fingerprints, adding a touch of Belle Epoque decadence to the burghal, a gilt lining of Chicago’s famously blue collar. 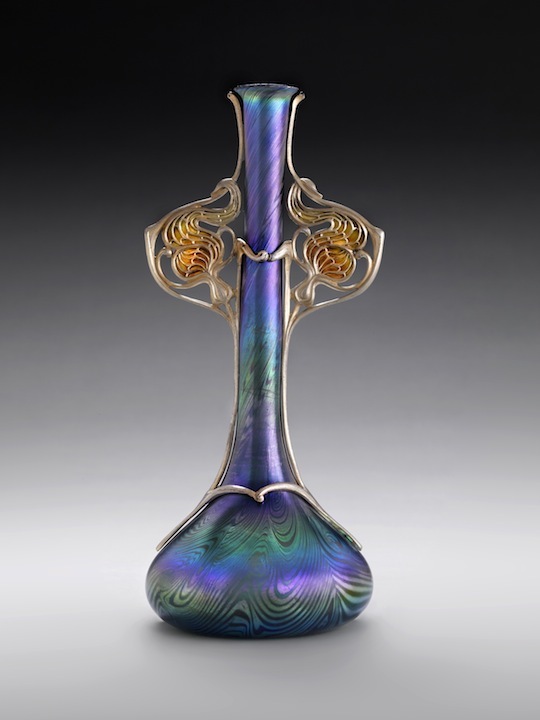 “Louis Comfort Tiffany: Treasures from the Driehaus Collection” shows through June 29, 2014, at 40 East Erie.